The Million Dollar Highway, a two-lane blacktop between Durango and Ouray, is part of the 236-mile-long San Juan Skyway that squiggles through the rugged San Juan Mountains in southwestern Colorado. The skyway, a designated All-American Byway, is one of the state’s must-do scenic drives with mile after mile of eye-popping scenery. Its twisting Million Dollar Highway section is filled with hairpin turns, exposed sections without guardrails, and some of Colorado’s most spectacular views as it spirals over Coal Bank Summit, Molas Pass, and Red Mountain Pass. 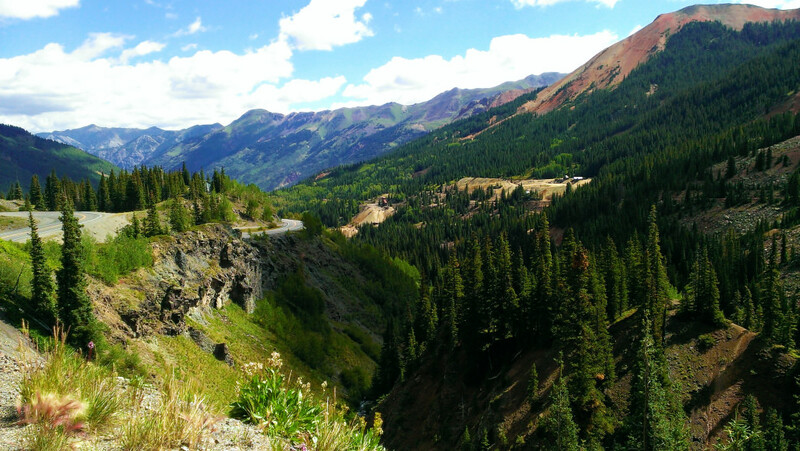 The 26 highway miles between Silverton and Ouray follow an old toll road built between 1880 and 1884 by transportation magnate Otto Mears, nicknamed "Pathfinder of the San Juans," to connect the Ouray and Silverton mining districts. The narrow track operated as a freight and stage line until Mears completed a railway from Silverton to the rich mines on Red Mountain Pass a few years later. The Million Dollar Highway, traversing Mears’ wagon route, was completed in 1924. Why is it called the Million Dollar Highway? That’s the burning question everyone asks, but there is no right answer. Some say that gold-bearing gravel worth a million dollars was used to pave the road in the mid-twentieth century; others argue that it cost a million dollars a mile to build; and Ouray locals joke that you couldn’t pay them a million silver dollars to drive the treacherous highway in winter. Whatever the answer, the truth is that the mountain views from the highway are worth a million bucks. The 70-mile stretch of highway between Durango and Ouray is the quintessential Colorado road trip that leaves flatlanders white-knuckled as they negotiate tight turns and hug the inside lanes when the highway edges above sheer cliffs. It’s a day trip best done after the snow has melted or in September when golden aspens shimmer on mountainsides. Besides steering wheel recreation, the Million Dollar Highway offers lots to do and see. You can explore three Victorian-age mining towns, ride a narrow gauge railroad, trek up 14,157-foot Mount Sneffels, soak in hot springs, hike miles of trails, and ride a jeep over America’s highest backroads. Begin your million-dollar adventure in Durango, the southern gateway to the San Juans. Durango, an old railroad town, began in 1880 as a supply center for miners. The compact town, straddling the Animas River, is still a railroad hub with the historic Durango & Silverton Narrow Gauge Railroad steaming north for 45 miles to Silverton. The rail ride through the rocky Animas River Gorge is a bucket-list trip that bankrupts the English language. Durango is also one of Colorado’s best outdoor towns, with mountain bike trails, fly-fishing streams, rock for climbing, kayaking and rafting, and hiking trails. The drive, following U.S. 550 and the San Juan Skyway, heads north up the Animas Valley. Trimble Hot Springs makes a relaxing stop with two therapy pools and an Olympic-sized pool heated to 82 degrees. After entering San Juan National Forest, the road climbs past Haviland Lake and its 45-site campground to Purgatory Resort. The family-friendly ski area offers five terrain parks, 1,360 skiable acres, and an average of 260 inches of Colorado powder. Coal Bank Summit, a 10,640-foot pass, offers views of glaciated Twilight Peak in the West Needle Mountains. The highway then winds up a shallow valley to 10,910-foot Molas Pass and one of those breathtaking million-dollar views. Pull off at an overlook to see sharp peaks spiking the horizon in every direction, with the rugged Needle and Grenadier Mountains looming to the east. Molas Lake, tucked in a hollow below, offers camping, fishing, and hiking. The highway descends steeply for five miles from the pass to Silverton. Use your gears to slow down and don’t ride the brakes. Silverton, tucked in a broad valley ringed by 13,000-foot peaks, is an isolated town, sometimes cut off from the outside world for days during the cruel winter months. It flourished as an 1870s mining camp that boasted 30 mills, two smelters, 37 saloons, and many opium dens, card houses, and brothels like the Shady Lady on Blair Street. Now the town wears its colorful history well. Silverton looks like a movie set when you walk down Greene Street, the main drag, with false-fronted buildings, a 1903 brick jail, perky miner’s cabins, colorful Victorian homes, and a gold-domed courthouse. After exploring the town, go hiking and backpacking in the 499,771-acre Weminuche Wilderness Area, take a jeep tour up Cinnamon Pass, or climb at The Stripe and Trainrobber Wall. The next section of the Million Dollar Highway follows the old Silverton Railway’s right-of-way, edging above drop-offs and passing shuttered mines. Five miles up the South Fork of Mineral Creek is South Mineral Campground and the trailhead for Ice Lake Basin, an above-timberline cirque lined with jagged mountains like Vermillion Peak and Pilot Knob. Waterfalls and wildflowers fill the basin in July and August. Another turnoff leads to the Ophir Pass Road, a reasonable four-wheel-drive track over 11,750-foot Ophir Pass. The blacktop climbs past the ghost town of Chattanooga, destroyed by fires and avalanches in the 1890s, and reaches a left turn onto the infamous Black Bear Road, one of Colorado’s most feared 4x4 tracks. A sign warns: You don’t have to be Crazy to Drive this Road—But It Helps. 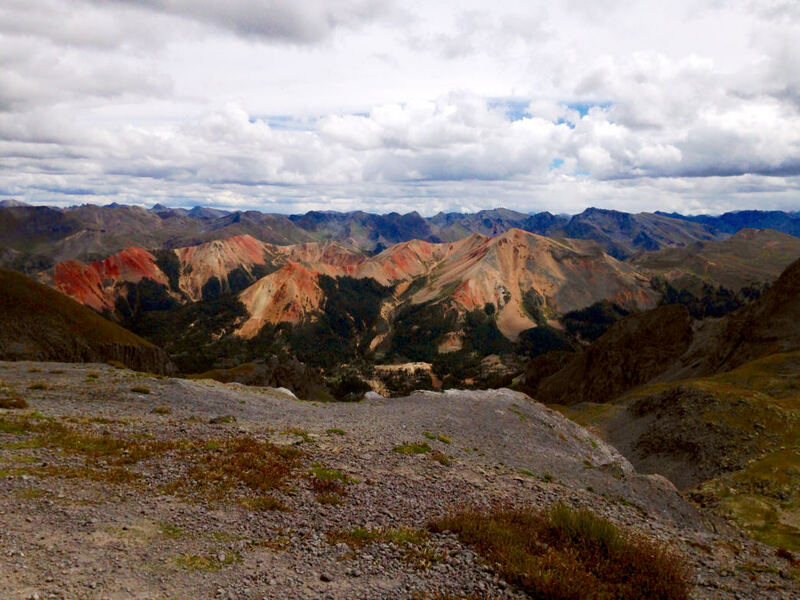 The perilous 12-mile jeep trail crosses 12,480-foot Black Bear Pass, then descends to Telluride on a rocky one-way section. 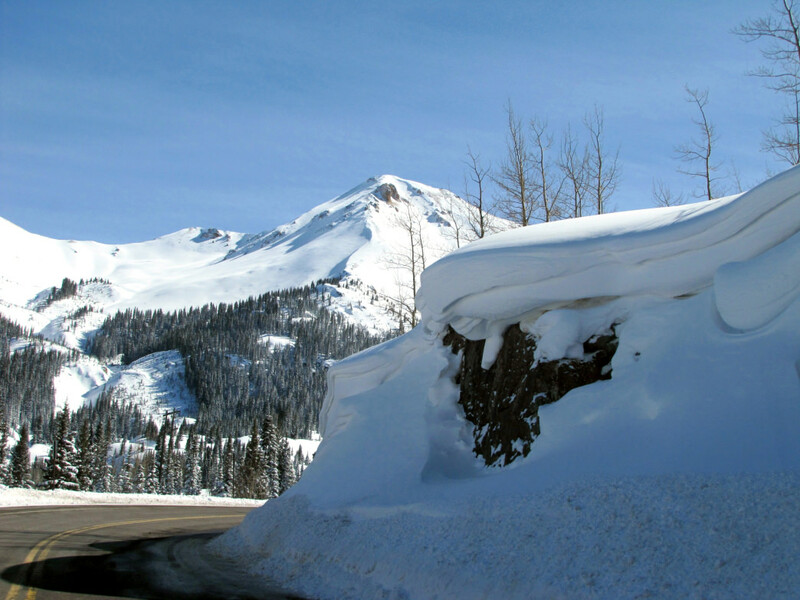 Past the turnoff, the road crosses 11,018-foot Red Mountain Pass in a narrow valley filled with willows and beaver ponds. Pullouts along the highway make good photo stops. Nearby are the wooden ruins of the old Longfellow Mine. The Million Dollar Highway begins twisting down a maze of switchbacks, passing mountainsides pockmarked with abandoned mines like the Mountain King, All American Girl, and Cora Belle, weathered headframes, and ore dumps. Miners dug millions of dollars in silver and gold from the cherry-tinted slopes of Red Mountain. 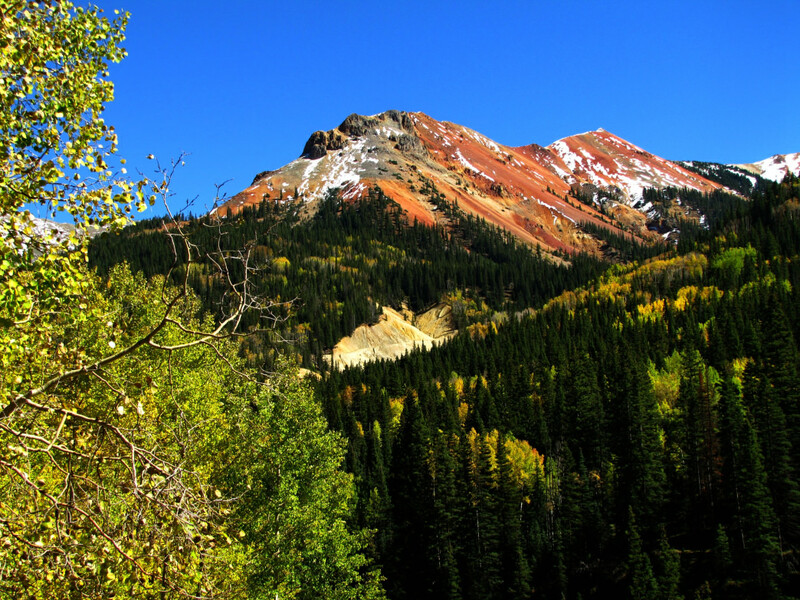 One of the biggest producers was the famed Idarado Mine which bore west through the mountains to Telluride. Pull off the highway to look at the historic mine, but don’t trespass on private mining claims. Farther down, the highway enters Ironton Park, a flat valley floor with a sparkling creek. It’s the best place for shimmering autumn colors on the drive, with towering slopes splashed with orange and yellow quaking aspens in late September. The narrow highway drops through Uncompahgre Gorge, an abrupt canyon carved by the Uncompahgre River. Uncompahgre, meaning "hot water springs," is the word the Ute tribe used to describe the area. Travel down the atmospheric gorge slowly as the highway, without guardrails, edges across precipitous slopes hundreds of feet above the raging river. Avalanche chutes close the highway in winter, including the deadly Riverside Slide, an avalanche path now topped with a snowshed. One of the last stops is a scenic overlook above Bear Creek Falls, which plunges 227 feet to the river below. The highway switchbacks down to Ouray, a picturesque town dominated by mountains, and the northern end of the Million Dollar Highway. 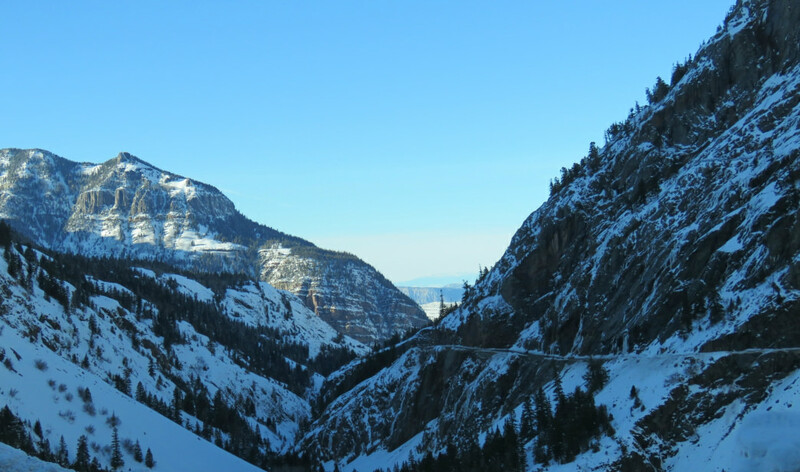 Ouray, named for a Ute chief, thrives as a real mountain town with one main street, no traffic lights, three waterfalls, four hot springs, and the famous Ouray Ice Park with hundreds of ice climbing routes. Check out Box Canyon Falls, camp at Amphitheater Campground, take a jeep tour over Imogene Pass to Telluride, and then soak in the 104-degree water at Ouray Hot Springs. Originally written by RootsRated for Durango Area Tourism Office. I traveled the Million Dollar Highway soon after it was constructed, once in a blizzard, once in a blinding rain. Vivid childhood memories. This was a most memorable trip for me! Beautiful scenery. Gods handiwork Is amazing! Love Colorado! Traveled when a child from Farmington NM to Grand Junction. Always loved the drive. It’s my favorite drive. I did it also last March on my 80th birthday with my son and Jodi I was so happy when it snowed, since I live in FL. My son lives in Durango and we take that drive every time I visit. Love it the hot tubs too. This is one of the most spectacular rides in the US. I rode this back in June on a motorcycle with my buddies. Breathtaking!! awe inspiring !! I’ve ridden many beautiful roads around the country during my many years of riding…this was a very special ride. Not for the faint of heart on a bike…do yourself a favor and see it for yourself! When our vehicle broke down, I rode the Million Dollar Highway from Red Mountain Pass to Ouray on a 10-speed bike to find help 25 years ago. What an experience in feeling insignificant in the universe. I own a house in Ouray about 3 miles north of the second picture. This is a wonderful part of the world. 1992 August I drove my 1990 4wd syncro westfailia camper over Black bear pass , with Teluride in view in low gear standing on brake pedal slipping from one bolder to the next out of control door open if I needed to jump , but I made it to Teluride safe. Wow what a memory!!! I lived in Steamboat Springs for 7 years in the 70’s and always thought Rabbit Ears pass was beautiful, after driving the million dollar highway two weeks ago, it is definitely #1 senic drive in my book. Hopefully I will be back from Minneapolis soon to do it again. I drove this highway a few years with my wife, daughter and grandkids. My grandson and I really enjoyed it including the places to pull off for fantastic views. But my wife and daughter were very nervous. They ask me to find a another direction to leave Durango and drive to Denver, which I reluctantly did. What a wonderful view of God’s beauty. I hope to drive it again soon. I hope I get to see a lot the Million Dollar Highway.